Christmas is the most anticipated festive day of the western world. It is the birthday of Jesus Christ, the saviour of te world. 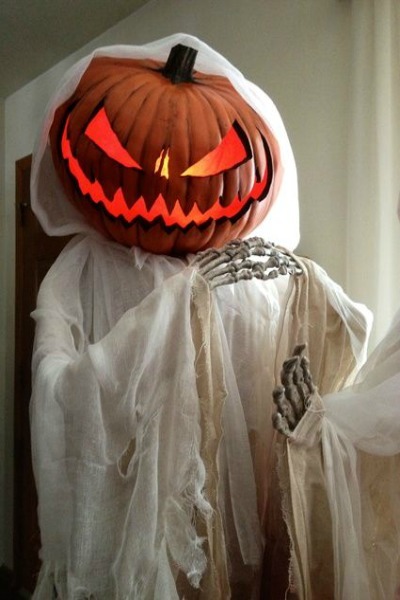 Since the passing of Halloween Night children and adults look forward to Christmas day for some much needed family time and joy. Houses are decorated, presents are exchanged, Christmas trees are decorated, kids make their wish and there’s a grand feast on the special day too. Christmas brings with it many associated things like christmas tree decoration, Gifts from santa Clause to children and more. On this day every household brightens up with lights and decoration and they also decorate a christmas tree to celebrate the special day. 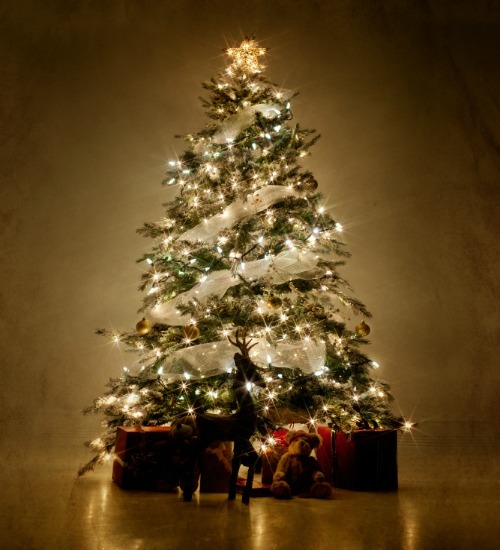 While it’s quite easy to set up your very own christmas tree , decorating it could be a problem for many. 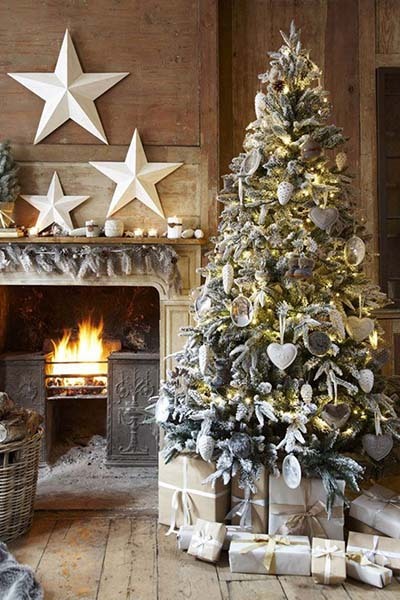 Today we have some wonderful Christmas tree decoration ideas to show you , so that you can choose the most appropriate theme for yourself this year. 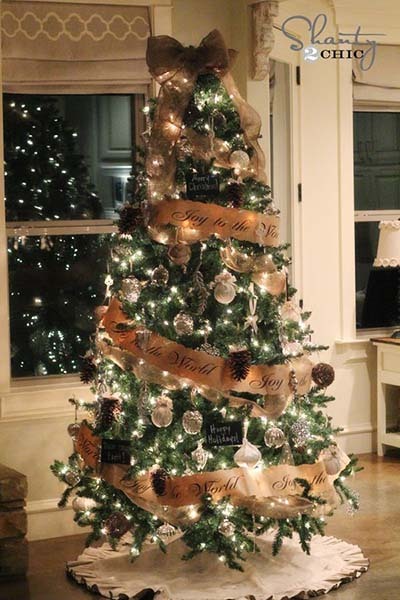 This christmas tree is decorated with small christmas lights and burlap ribbons . There is a mesh bow design on top which makes it look attractive. Decorated with christmas ornaments in gold and silver this tree decoration idea is a traditional and a favorite among many. 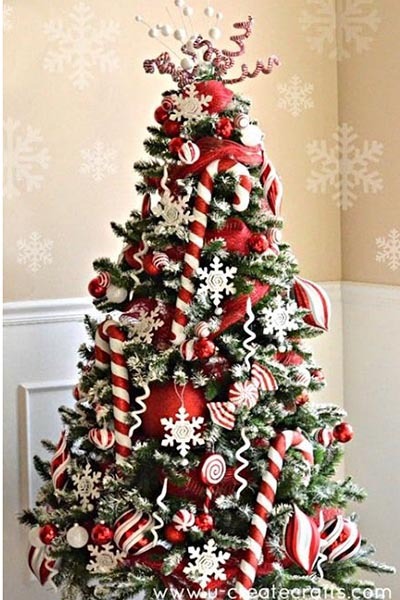 If you are someone who loves to try out new things and designs each year and want your christmas tree to be unique each year then here’s a new way to add a new look to your christmas tree. 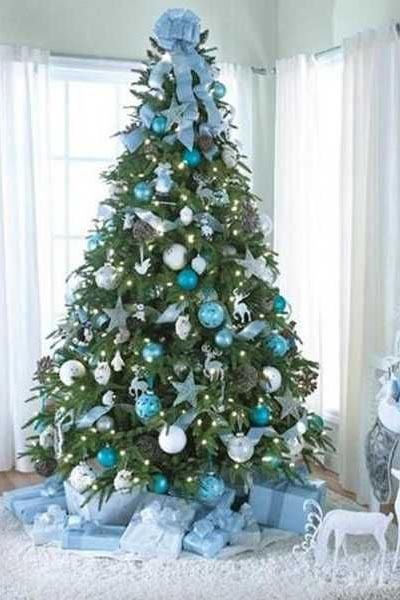 Add christmas tree ornaments in a single color or close colors like above the color blue is dominant . Use matching shades of gift wrap too for the gifts to place below. Add a reindeer decoration or cutout beside in a color matching the overall theme. 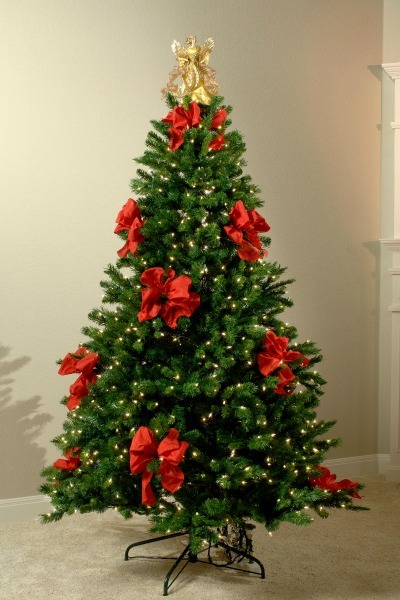 If you like the traditional designs and want a traditional look for your Christmas tree then this is a good option. 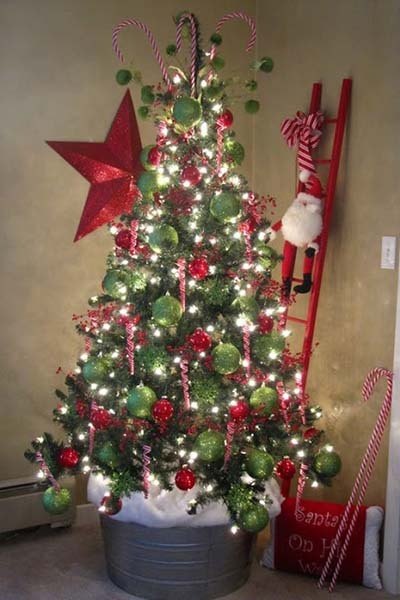 The tree is decorated with green and red metallic and glittery christmas ornaments and candy cane decorations. Some candy canes are kept beside the tree along with some Christmas miniatures. 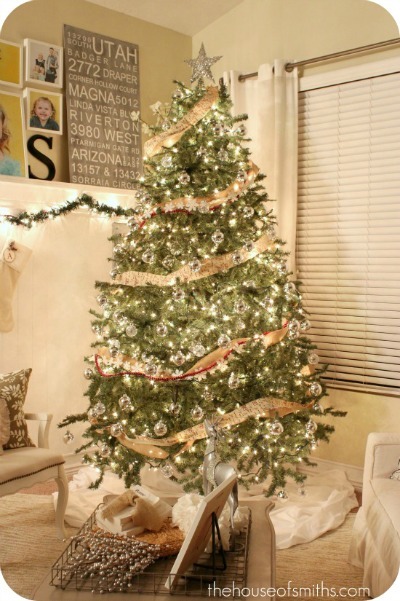 If you want a heavy decorated tree this holiday season then this idea looks great. 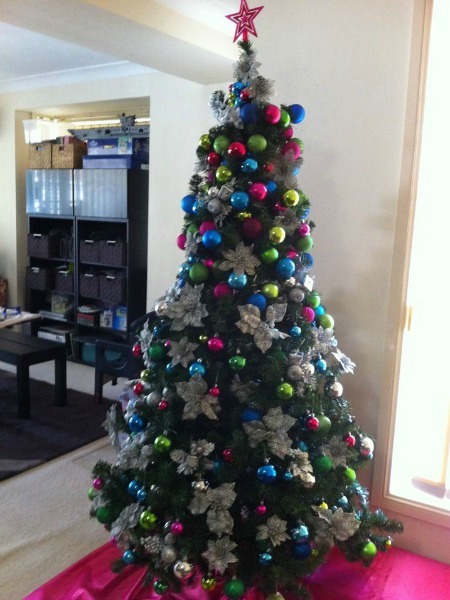 The tree is decorated with Christmas decorations, glittery balls, ribbons and candy cane decorations. 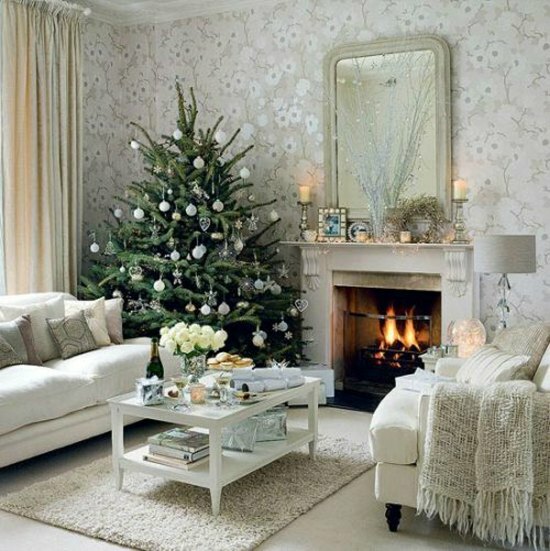 This white christmas tree looks glamorous and quite unique where most people use the usual trees. As red goes perfectly with white this decoration uses red and golden christmas decoration to make their christmas tree look all dressed up. 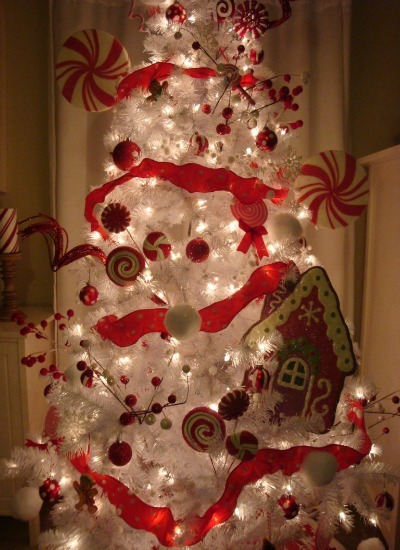 Christmas ornaments in red and white have been used along with lots of candy cane, lollipop decoration and ribbons. 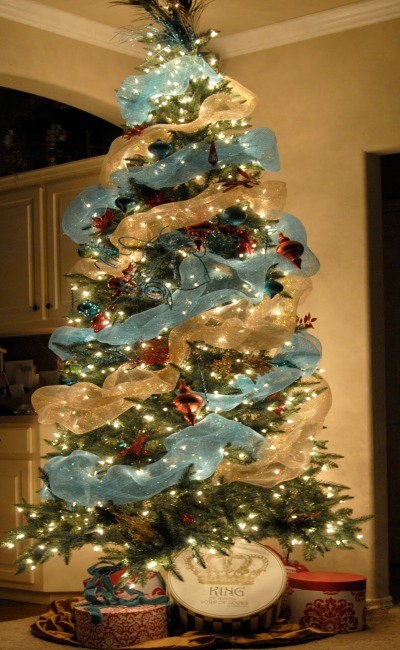 If you love ribbons and are planning to decorate this year’s christmas tree with ribbons then this is a great theme for you. Here white , silver and blue ribbons and mesh have been used along with silver christmas ornaments and lots of small decorating elements. This decoration idea is unique with a ribbon swirl effect provided by the three colored christmas ornaments. The ornaments are hanged to give an illusion of a swirling effect on the tree. Christmas lights are also added to heighten the swirling effect. A large star figure is added to the top . This christmas tree uses some adorable mini sized snowman figures to decorate the christmas tree along with lots of mesh, metallic beads and fake snowflake decoration. 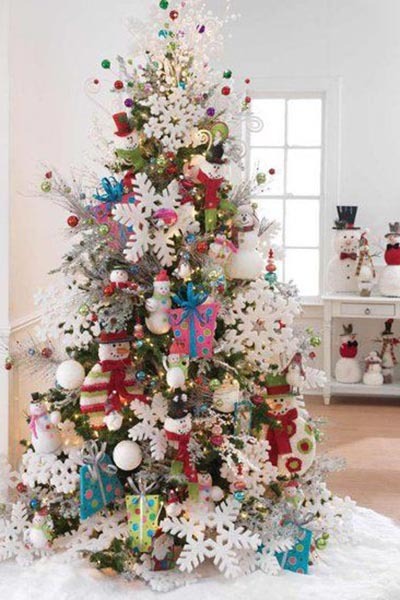 The different snowman figures and lots of white and red christmas ornaments make this christmas tree decoration perfect. This unique decoration idea shows how you can use pinecones to decorate your christmas tree this year. You can use the pinecones as they are or you can color them in any color which goes with your christmas decoration theme and use them . Here christmas lights, christmas glass round ornaments and colored pinecones are used to give the tree a unique look. If you want a white themed christmas decoration rather than using a white christmas tree then this decoration idea will surely be useful to you. This tree has been decorated with lots of small snowman figures and lots of different sized snowflakes. There are also some colorful presents hanging from the tree too. Covered with a soft white rub in the base the snow effect looks perfect. If you’re looking for a christmas tree decoration idea which will get loads of appreciation from everyone then this idea is really nice. 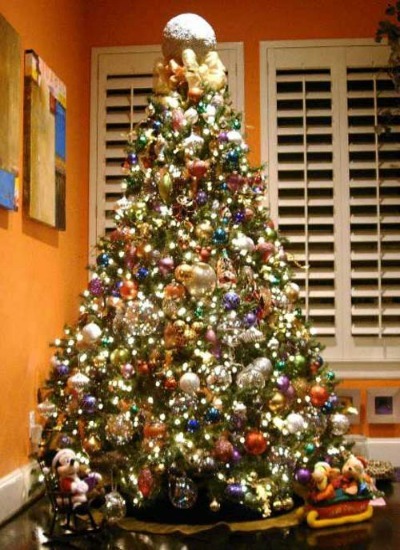 A golden tree has been decorated with similar colored golden ornaments and christmas decoration. 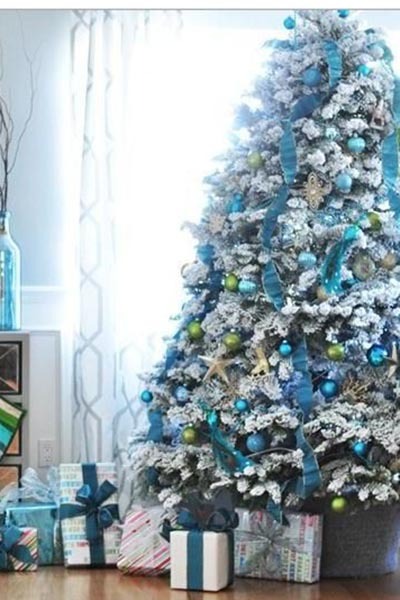 inspired by snow this blue and white color combination works great as the tree has been given a snow-covered look and blue ornaments along with green and golden ornaments are hung from the tree boughs. Blue ribbon is used to decorate from top to bottom as well. The final touch is given with those colorful gifts kept at the bottom with matching blue colored ribbon. 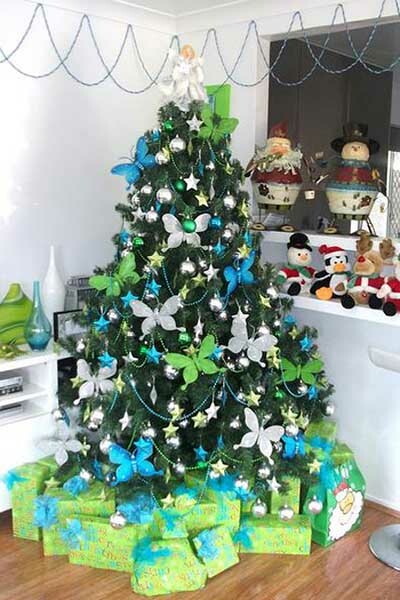 This small christmas tree uses stars and butterflies to decorate the whole tree. A color combination of green, blue and silver has been used for all of the decoration.The large butterflies are hung from the boughs and some strung beads are used to decorate as well. 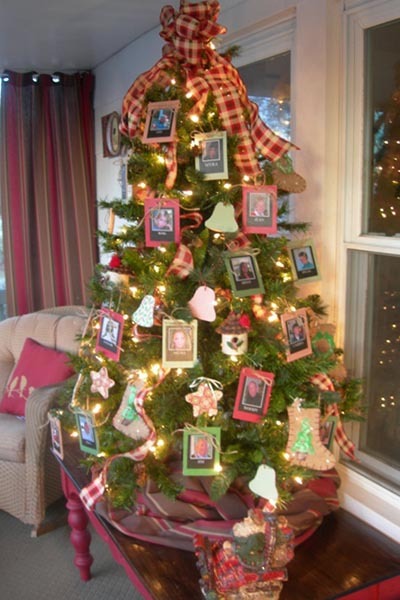 personalizing your christmas tree with pictures of all family members seems like a very beautiful idea but you might get puzzled how to do that. Here’s how you can do it easily with some cute family pictures framed with some colorful paper. Add some ribbons and some christmas lights and this easy and unique decoration is complete. If you are short of space for a full sized christmas tree then this small potted version works great too. 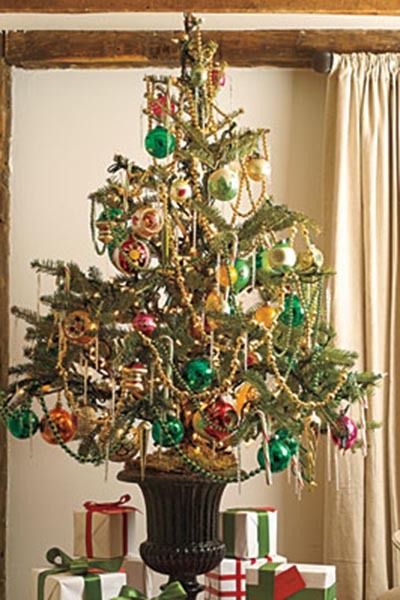 To decorate the tree use colorful and ornaments and threaded beads. Also don’t forget those colorful presents below the tree. Here’s another way to decorate a small potted christmas tree with some delicious looking ornaments. 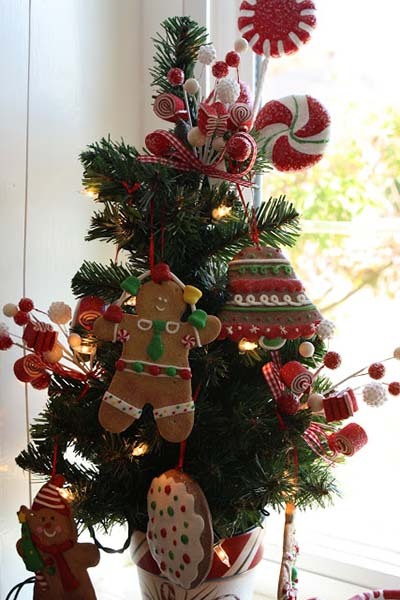 Here the ornaments are large gingerbread man and cookies decoration. Some candy canes and other sweet treats are used to decorate as well. If you have decided to keep gold as a main theme color for this year’s christmas you can easily decorate your christmas tree with golden mesh and ribbons. Here the ribbon and mesh are wrapped around the tree in equal distances and small christmas lights have been used. 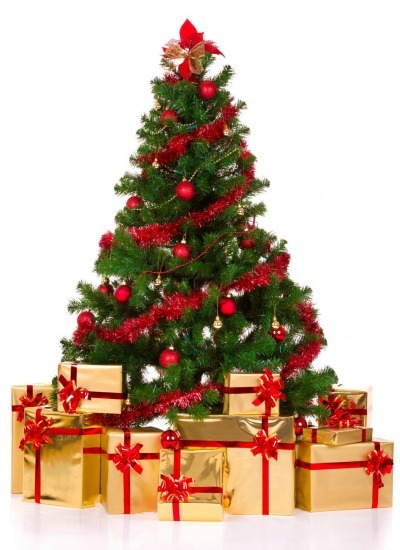 Some golden christmas ornaments are hanged from the boughs and many christmas presents are lined up below the tree to make the christmas tree look spectacular. 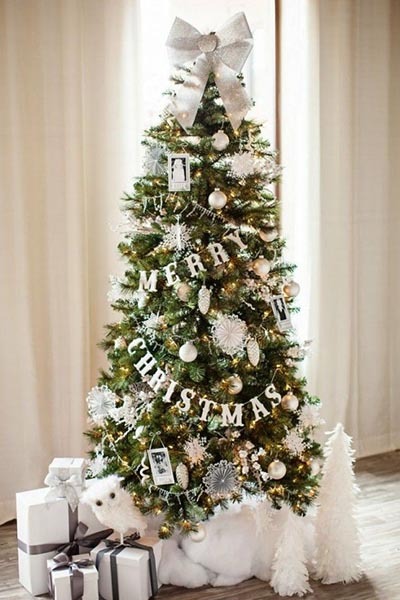 This white themed christmas tree uses mostly white ornaments and decorating elements. Various snowflake hanging decorations, lights, balls, letters and picture frames are used to decorate this tree. Color matched packaged surprise gifts are also kept below the tree. This very colorful christmas decoration theme surely is easy yet looks unique and so colorful. Here round metallic hanging balls are used to decorate the white christmas tree. 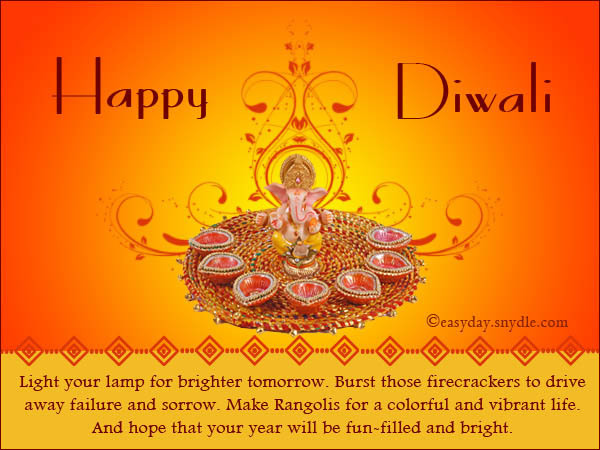 The decorations are bought in four color category namely purple, blue, green and red. Multiple sized are used to make the decoration seem unique and pleasant. A large red star is used at the top. 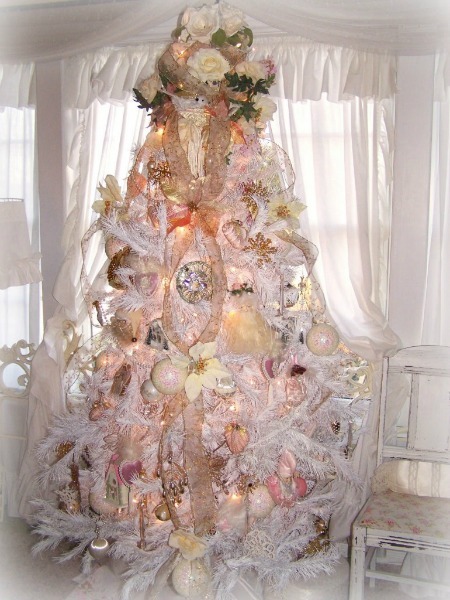 Gold and Silver themed christmas tree here is decorated with ivory white embellishments and ornaments. Small pictures are hanged from the boughs and messages and small white decorating elements are used for the tree. 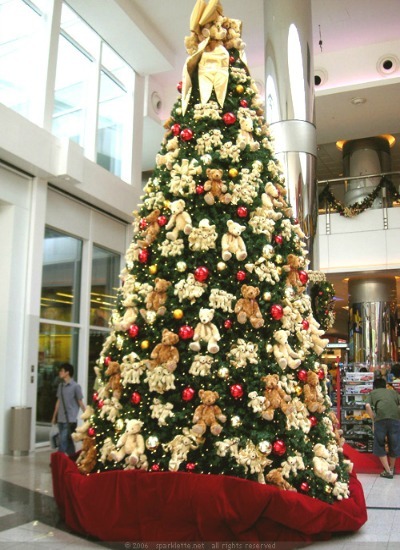 The tree here is decorated with numerous different shaped and sized teddy bears. teddy bears in different sizes and colors are used here to decorate the tree along with metallic balls and some christmas lights. 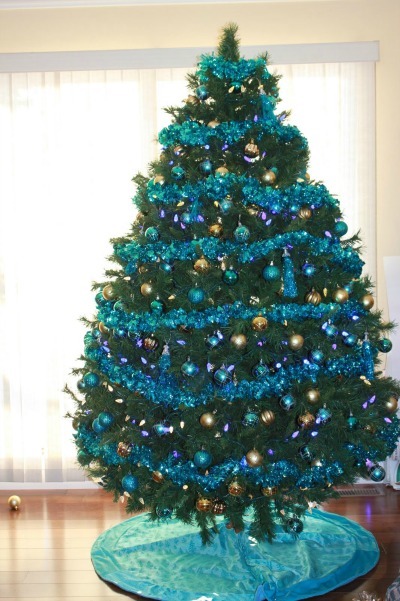 This tree is decorated with blue ornaments and golden ornaments. Blue glittery ribbon has been used here to decorate. 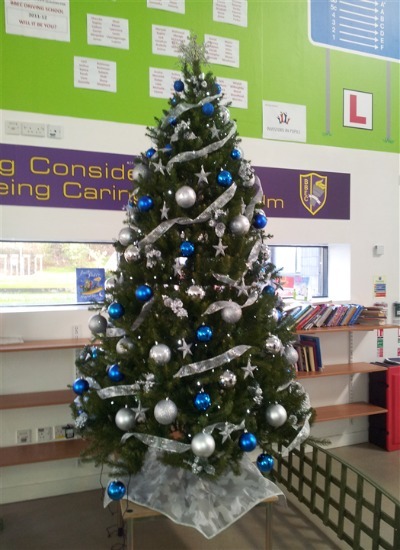 Blue, purple and golden balls are used for this blue themed christmas tree. If bows ae your favorite or if you have very limited time in your hands then this simple decorating idea will do the trick. Get some bright satin bows and hang them on the tree but keep them apart from each other to keep the tree in focus. Also add some christmas lights to decorate. If only bows are looking too dull for you then add some white decorative hanging decorations like some snow flakes, some fairy min hanging pieces and some bells too. Add some small red bows or any colored bows you wish to use. In this christmas tree decoration idea the christmas lights make all the difference. The golden mesh adds to the unique look and the glowing star on top completes the unique christmas tree decoration. This colorful christmas tree decoration is a great way to use all of those colorful christmas lights you have at home. 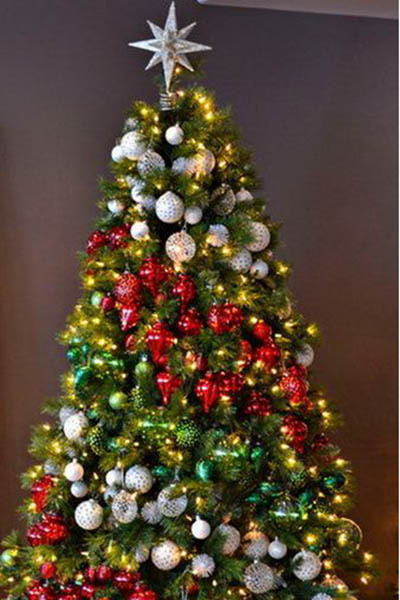 Wrap different colored lights around the tree and also use lots of small christmas decorations like bows mesh and bells. 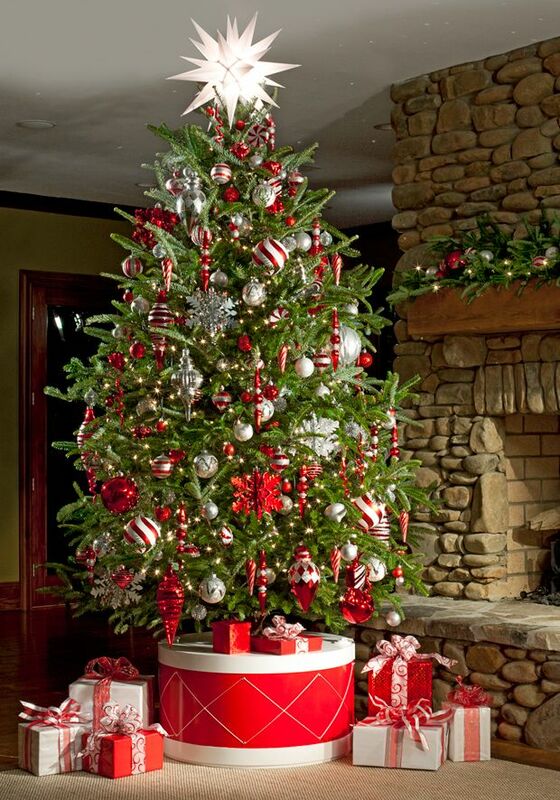 Red has been one of the most used colors for decorating most christmas trees. Here red glittery ribbon has been used to decorate as well as red hanging glass balls. Some golden beads are also used to decorate the tree. To go with this theme some golden gift wrapped presents are kept under the tree . This simple decoration is very easy to do because all you need are some white christmas decoration and some white decorative balls to hang on to the boughs. the white and green combination is a tried and tested christmas decoration combination. 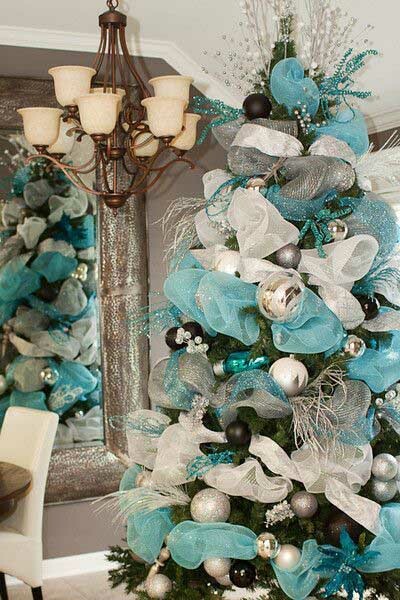 Another very easy decorating idea is this white and blue decoration seen here. The silver glittery ribbons and the blue and silver balls make the decoration colorful yet simple enough for any first timer. 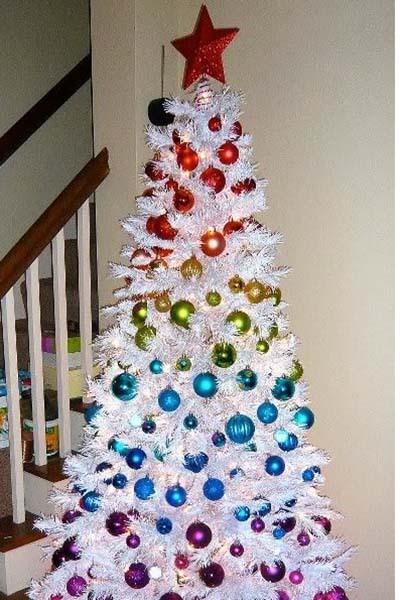 If you’re ready for some challenge and want to set up a colorful tree this time then here’s a great idea.This tree has so many decorating elements and managing them in an ordered way can be a problem for those who are new to decorating christmas trees. But if you’re up for the challenge gather all sizes and colors of christmas balls for decoration. 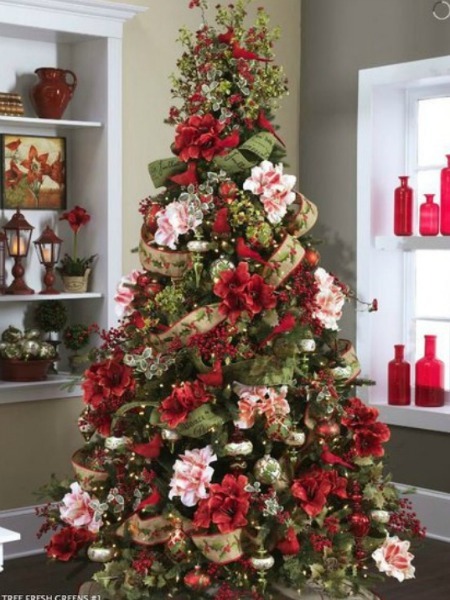 This large and colorful christmas tree is a delight to the eyes. 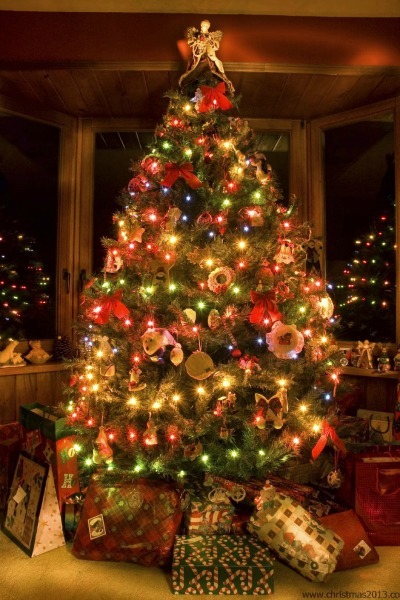 The bright and colorful christmas lights used here give the main colorful look to the tree. The golden balls as well as the green balls make the tree looking spectacular. This colorful christmas tree decoration looks beautiful with so many pink accessories and ornaments. 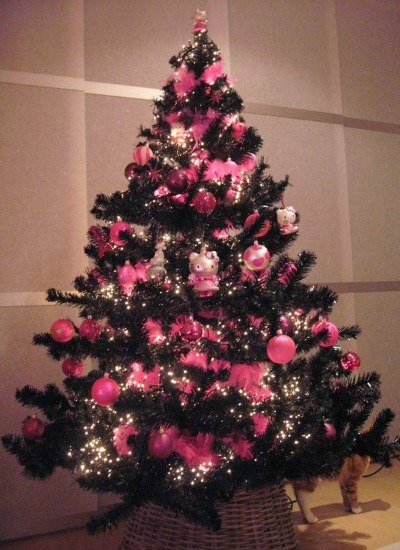 Cute pink toys like Hello kitty miniatures and pink balls have been used to decorate this tree. 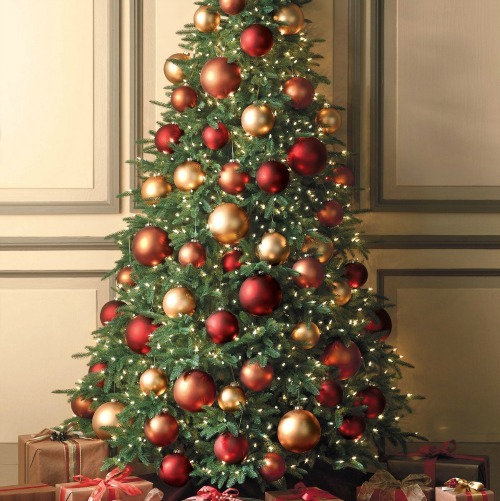 This golden and red christmas tree is very traditional looking yet has a uniqueness. The golden , red and silver ball decorations look beautiful hanging on the tree and the threaded beads also add to the beauty . 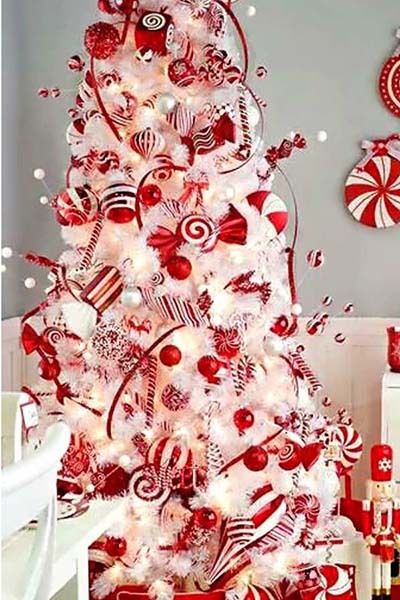 This white christmas tree decoration looks superb with so many red decorations added to it like red nd white swirly lollipops, santa clause house , candy canes and red glittery balls. Some ribbons and christmas lights complete the look. 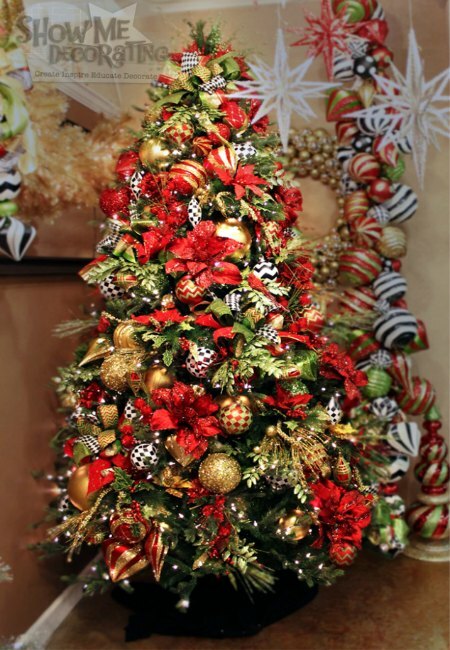 Colorful is the word you will hear guests say if you decide to decorate your tree like the one shown above . 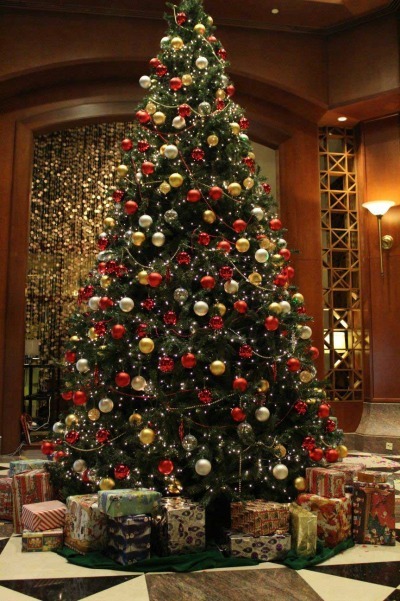 the tree has bright colored mesh wrapped abound the tree and striking red colored stars and balls decoration make it even more colorful. Some burlap ribbons, some glass ball decorations and lots of sparkling lights make this christmas tree decorations stand out. 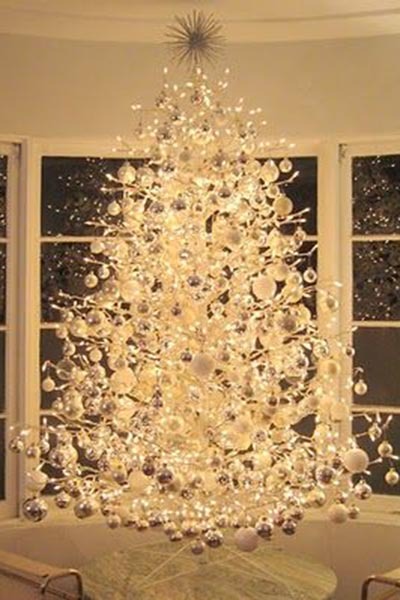 The golden burlap ribbon and the glittery glass balls make the tree stand out and the lights add beauty to it. Decorated with blue and golden mesh and christmas lights this is a fairly simple theme for christmas tree decoration. The glitter ribbons and the hanging decorations make this tree look more spectacular but simply it has very little effort and anyone can achieve this simple look for their christmas tree this year. 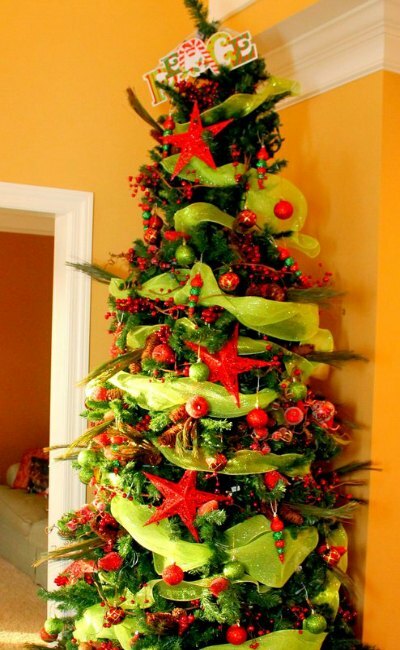 Here green mesh has been used along with many colorful decorating ornaments to make this christmas tree stand out. 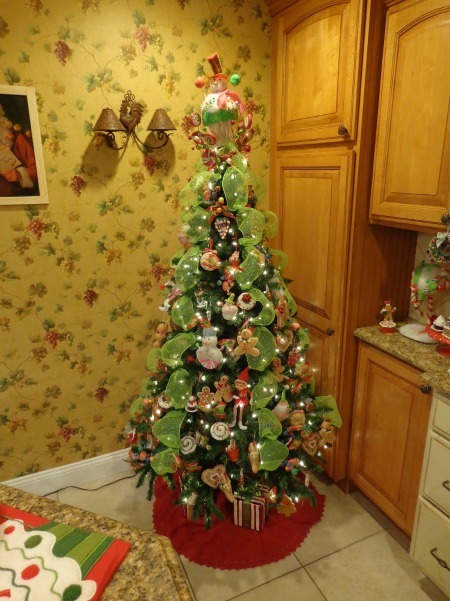 There are gingerbread man hangings, snowman and elves hangings as well as candies and small christmas lights making the tree quite spectacular. 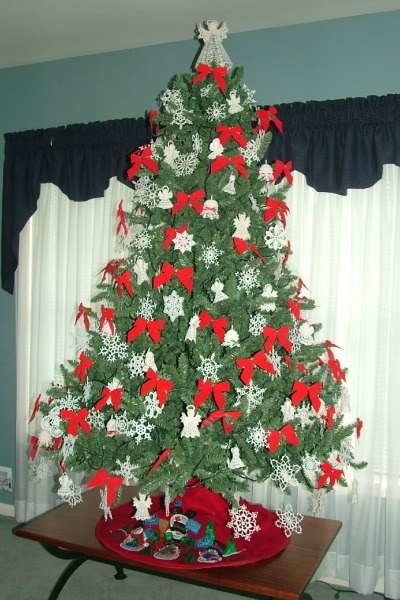 This small white christmas tree is decorated beautifully with small red hanging ornaments. 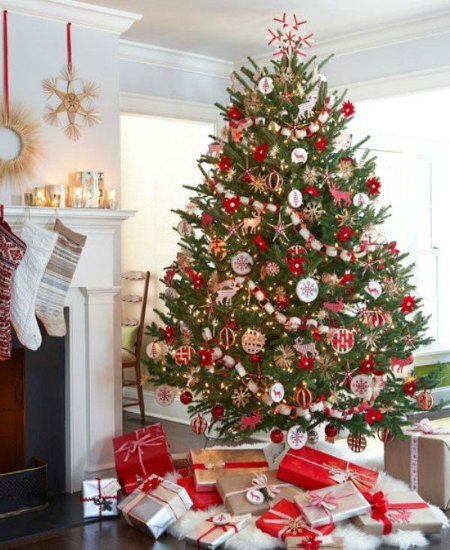 The theme here is santa clause and the north pole and small reindeer and presents are placed below the tree to make the theme more prominent. Even if you have an average sized tree or a small sized one you should not feel like there are limited options for decoration. Here’s how you can use lots of colorful bows, golden balls, ribbons and christmas lights to decorate the tree. 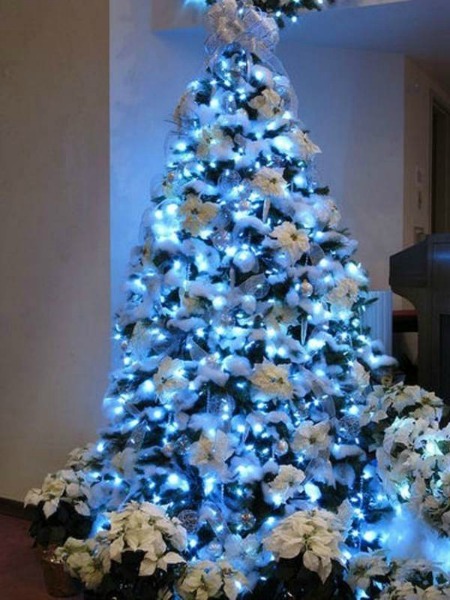 This blue and White flower decorated christmas tree is really a great idea to make your christmas tree look quite different . Decorated with mesh and lots of white flowers this tree is unique because of its use of blue christmas lights. The Blue lights give the effect of blue flowers being used here. Here we can see another white christmas tree decoration idea. 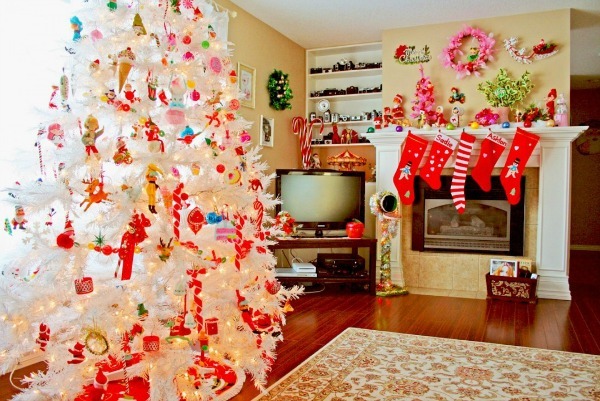 Here the artificial christmas tree in white is decorated with the red christmas ornaments. 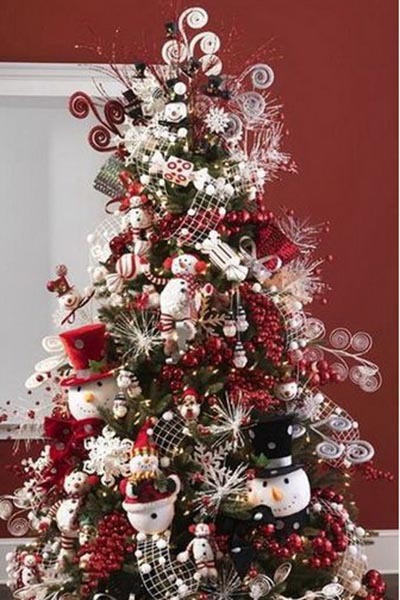 The red color goes beautifully with the white tree making it perfect choice for anyone looking for decorating options on a white christmas tree. Red ribbons, cute dolls, ice cream cones, santa clause miniatures and some other ornaments are used here . 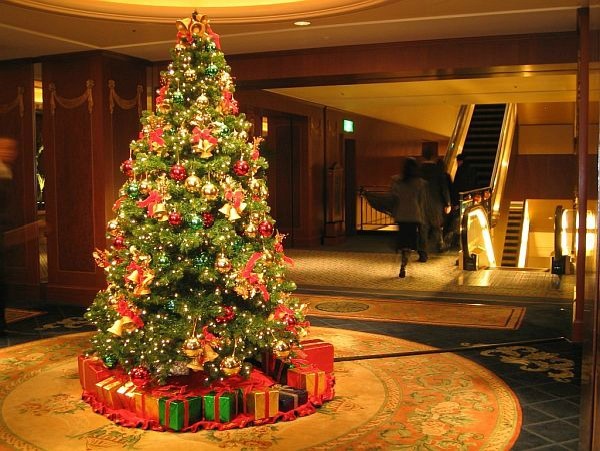 This beautiful looking christmas tree will surely be appreciated by every guest this year. 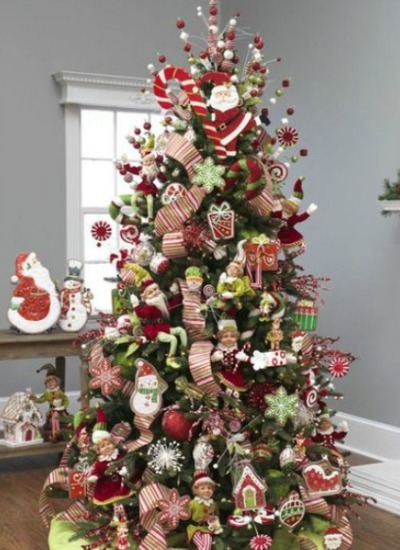 This is a traditional looking christmas tree decoration and will require usual christmas tree ornament like golden round ornaments, lots of ribbons , christmas bells, and christmas lights. Don’t forget those matching christmas presents below the tree. 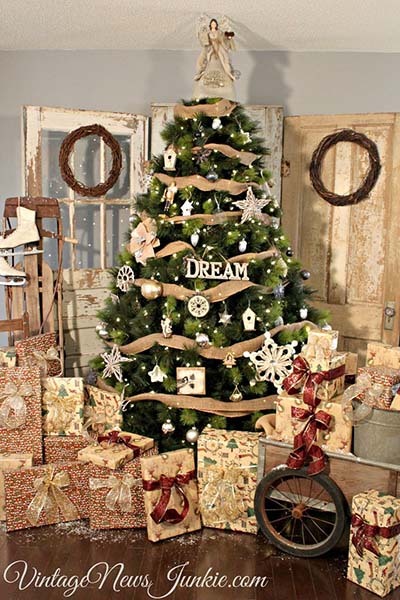 Use of Burlap ribbons and lots of flowers make this christmas tree stand out from the crowd. Here flowers in pink and red have been used. 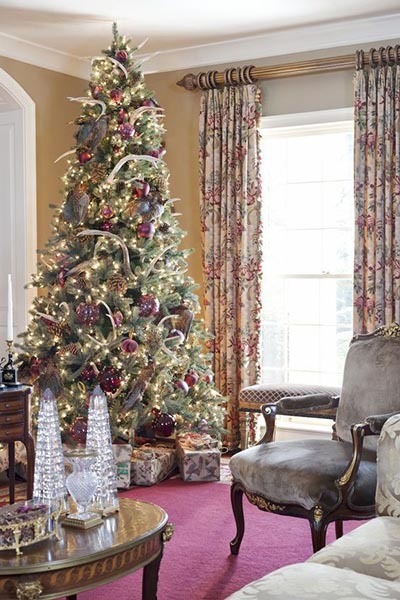 Golden and red burlap ribbon is used to decorate as well as some christmas tree and some bow designs. 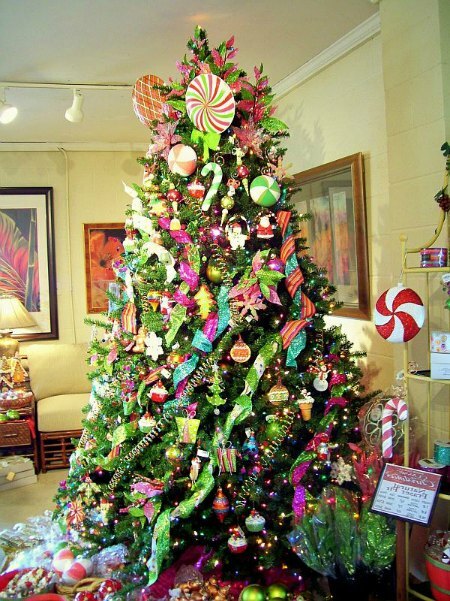 Colorful Glass round ornaments make this christmas tree looking quite interesting. The glass round ornaments used here are in yellow, golden , red , blue and green colors. Some white fake flowers are used to decorate as well as some christmas lights. If you’re ready to decorate your christmas tree in this unique Santa Clause and his Toy Factory theme then here’s what you will need. You will need some santa clause figures and decorating elements, some elves to decorate, some snowman miniatures and some cute house, presents and lots of colorful christmas ornaments and decoration. 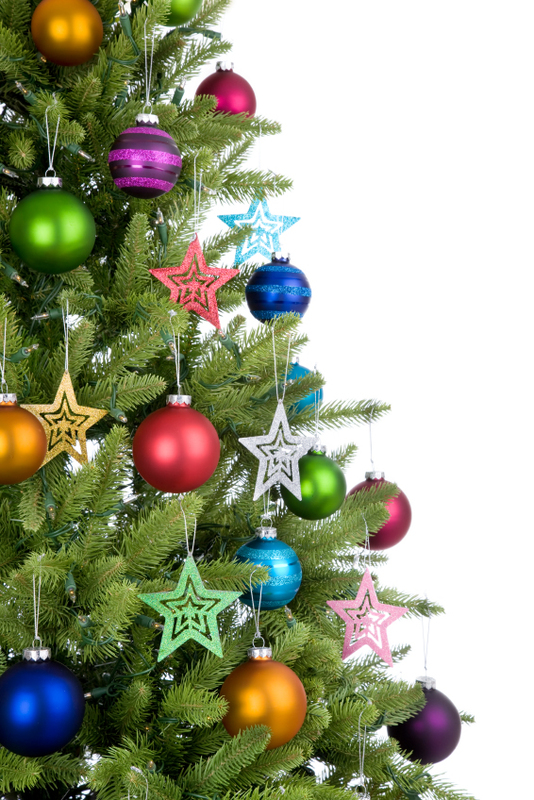 If you are a colorful and fun person and want your christmas tree to be unique and colorful choose this theme. Here colorful ornaments, Christmas present hanging ornaments, cupcake and ice cream cone miniatures, ribbons, mesh, colorful spring coils, candy canes and paper chains are used . Due to the large number of ornaments and colors used for the tree this is a nice way to decorate your christmas tree this season. This decoration is totally dependent on these glass /metallic balls which are used as christmas decorations. Here two basic colors are used for these ornaments which are red and golden. These ornaments are used in different sizes along with lots of christmas lights. 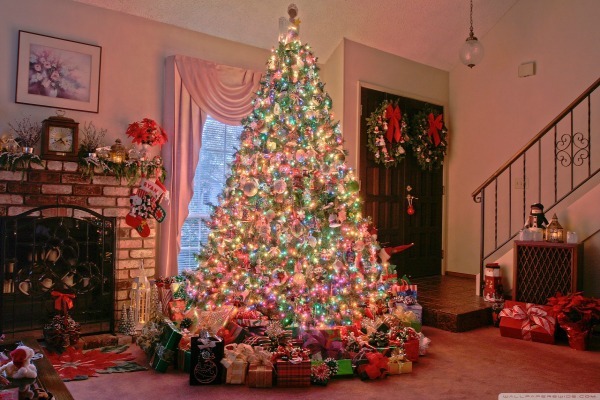 This traditional christmas tree decorating idea is really useful if you are not sure about what to choose. This decoration never goes wrong and you can easily find these ornaments at the store. Use lots of red and golden ornaments like reindeer designs, glass decoration balls, lights, colorful paper chains and more to decorate. Also place a furry carpet to cover the base and add some colorful presents to go along with the decoration. We hope these christmas tree decorations ideas have helped you to choose the best idea for you this christmas . Do choose a theme according to your christmas tree size, the amount of budget you have and the amount of effort you are willing to give for the decoration.Do keep visiting Easyday for more such christmas related posts. We have many interesting posts on Christmas .